1,582 pages of CIA Bay of Pigs Official History compiled between 1974 and 1984. 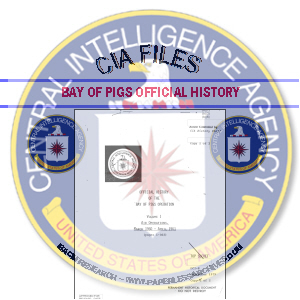 1,582 pages of CIA Bay of Pigs Official History compiled between 1974 and 1984. Three volumes of this five volume report were not available to the public until August 1, 2011. One volume was released in 1998. The fifth volume is still Top Secret and has not been released by the CIA. The still withheld volume contains a rebuttal to the 1961 report, "The Inspector General's Survey of the Cuban Operation." That IG report was a highly critical internal CIA inquiry into the Bay of Pigs invasion. During the administration of President Dwight Eisenhower, the Central Intelligence Agency (CIA) developed plans to use Cuban exiles to overthrow the Castro government. The plans called for the involvement of the United States to remain hidden. Less than three months after succeeding Eisenhower, President John F. Kennedy on 4 April 1961, approved the Operation Zapata Cuba invasion plan. On April 17, 1961, 1,300 Cuban exiles trained in Guatemala landed on Cuba's southern coast, Bahía de Cochinos (Bay of Pigs) in Las Villas Province. It was hoped that the invasion would be accompanied by a popular uprising in Cuba. Fidel Castro received warnings of the pending invasion and had ample time to prepare for the action. The operation collapsed by its third day. One-hundred and eighteen members of the invasion force were killed, 114 Cuban exiles and 4 American aircrew members. President Kennedy took public responsibility for the failure. CIA Director Allen Dulles and his staff resigned in September 1961. Twelve years after the failed invasion, CIA director William Colby commissioned CIA historians to produce an official history of the operation. On August 8, 1973, Colby's direction to the CIA history staff was that he wanted a report that would "develop accurate accounts of certain of CIA's past activities in terms suitable for inclusion in Government-wide historical and declassification programs, while protecting intelligence sources and methods." Nine years later, CIA historian Jack Pfeiffer completed the task in five volumes. Pfeiffer conducted interviews with many CIA operatives and officials. He had access to thousands of pages of CIA documents. Volume 1, "Official History of the Bay Of Pigs Operation - Air Operations, March 1960-1961," covers the fundamentals of the operation. Pfeiffer wrote in the forward of this first volume, "Air operations over Cuba from 15-19 April 1961 were, chronologically, the penultimate phase of the Bay of Pigs story -- the surrender, incarceration, and eventual release of the members of the 2506 Exile Brigade provide the conclusion of the story. Because what happened in the air not only could, but did, determine the fate of the US Government's anti-Castro program, the story of air operations is offered as the first volume in CIA's official, all-source history of the Bay of Pigs." "In the most simplistic of terms, the US Government's anti-Castro program which climaxed at the Bay of Pigs might have succeeded only if the air operations plans as evolved by CIA had been retained intact. The distortion of those plans for non-military, non-strategic purposes eliminated all margin for error and insured the establishment of the first Communist government in the Western Hemisphere. It is the purpose of this volume to trace the evolution of those air operations from initial, generalized plans suggested in the early spring of 1960, through the detailed tactical/strategic target plan of March 1961, and to the execution of air operations -- as determined at the 'highest level, between 15 and 19 April 1961. The story begins with the creation of the organizational and managerial structure to carry out Presidential policy; examines the problems of acquiring equipment, trainers, trainees, and training facilities; describes the combat air operations from 15-19 April 1961; and documents to the fullest extent possible the numerous controversial episodes concerning the role of Adlai Stevenson, the cancellation of the 'Second Strike,' the US Navy's air combat role on 19 April 1961, and the record of action and decision of various of the principals most closely involved in air operations." Volume 2, "Participation in the Conduct of Foreign Policy," contains information about the CIA's negotiations with Guatemala, Nicaragua, and Panama, aimed at getting support for the invasion of Cuba. It was important to use these countries to establish logistical and infrastructure support for an operation against Castro's Cuba. The report shows that to gain the support of Nicaraguan leader Anastacio Somoza, the Agency pressured the State Department to approve loans to Nicaragua. This volume reports on the high degree of cooperation received from the Guatemalan government. Volume 3, "Evolution of CIA's Anti-Castro Policies, 1951- January 1961," was released by the CIA in 1998 under the Kennedy Assassination Records Act, but remained undiscovered in the National Archives until 2005. This volume covers invasion planning during the end of the Eisenhower administration into the very early days of the Kennedy Administration. A highlight of this volume is the documenting of the role of Vice President Richard Nixon. The report shows that Nixon intervened in the planning of the invasion on behalf of William Pawley. A top Republican Party and Nixon campaign contributor, Pawley was a wealthy businessman who owned enterprises in Cuba. Pawley had previously been ambassador to Brazil and Peru. This volume refers to a November 15, 1960 meeting of the Task Force overseeing the invasion planning. This meeting was convened to prepare a briefing for President-elect John Kennedy. The minutes of the meeting seem to show the Task Force was having doubts that the operation would succeed. The report quotes, "Our original concept is now seen to be unachievable in the face of the controls Castro has instituted." The report further accounts, "Our second concept (1,500-3000 man force to secure a beach with airstrip) is also now seen to be unachievable, except as a joint Agency/DOD action." According to Pfeiffer this opinion was never shared with Kennedy. Volume 4, "The Taylor Committee Investigation of the Bay of Pigs," was previously released to its author, Jack Pfeiffer. The version contained in this set was approved for release by the CIA on July 25, 2011. This volume covers the Taylor Committee Investigation of the Bay of Pigs. This volume critically examines the investigation of the Bay of Pigs operation conducted by General Maxwell D. Taylor at the behest of President John F. Kennedy during the period from 22 April - 13 June 1961. Pfeiffer finds the level of blame placed at the foot of the CIA for the Bay of Pigs failure to be undeserved. Pfeiffer focuses on what he sees as errors of fact and omissions of critical information in the Taylor Report. Pfeiffer presents the exchanges between witnesses and interrogators, and he assesses the validity of the Committee's findings on the basis of the documentary evidence available at the time of the investigation.